The trailer for the documentary Girls Rock! which you can see on DVD on January 27th. 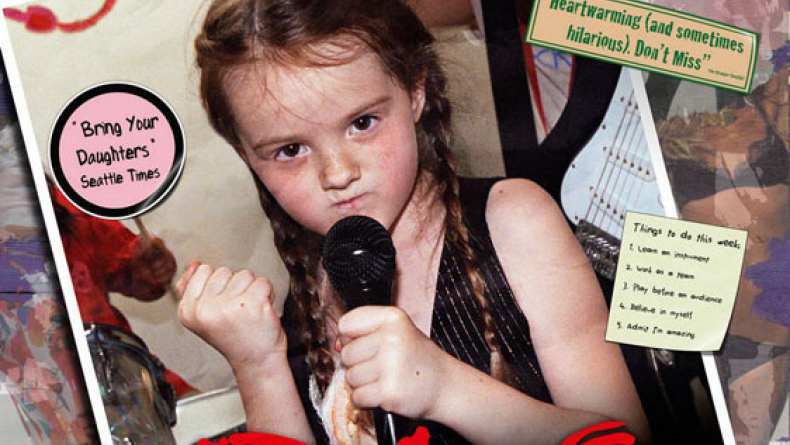 At Rock 'n' Roll Camp, girls ranging in age from eight to 18 are taught that it's OK to sweat like a pig, scream like a banshee, wail on their instruments with complete and utter abandon, and that "it is 100% okay to be exactly who you are." The girls have a week to select a band, an instrument they may have never played before, and write a song. In between, they are taught by indie rock chicks such as Carrie Brownstein from Sleater-Kinney various lessons of empowerment from self-defense to anger management. At the end of the week, all the bands perform a concert for over 700 people. The film follows several campers: Laura, a Korean adoptee obsessed by death metal; Misty, who is emerging from a life of meth addiction, homelessness and gang activity; and Amelia, an eight-year-old who writes experimental rock songs about her dog Pipi. What happens to the girls as they are given a temporary reprieve from being sexualized, analyzed and pressured to conform is truly moving and revolutionary.